A jury in the Western District of Pennsylvania returned a verdict in favor of Carnegie Melon University and against Marvell Technology Group, Ltd. and Marvell Semiconductor, Inc. The jury found literal infringement, contributory infringement and induced infringement of Patent Nos. 6,201,839 and 6,438,180. The jury rejected defendants’ anticipation and obviousness defenses and found that the infringement was willful. Total damages were $1,169,140,271 which makes this the third largest damages award in a patent infringement case. Carnegie Mellon University v. Marvell Technology Group, Ltd., et. al., 2-09-cv-00290 (PAWD December 26, 2012, Order). The court denied defendants' motion to reconsider its earlier ruling ordering the production of drafts of license agreements and related communications concerning the patents-in-suit. "Defendants argue that the Federal Circuit’s opinion in In re MSTG, 675 F.3d 1337 (Fed. Cir. 2012) requires [plaintiff] to make a heightened showing to get draft licenses and licensing communications. It does not. . . . [T]he Federal Circuit did not hold that 'a party seeking licensing negotiations must make a ‘heightened, more particularized showing of relevance.’' Rather, the Federal Circuit mentioned that one appellate court employs such a standard when confidential mediation communications are sought. The opinion, then, does not change the court’s prior reasoning about the relevance of Defendants’ executed and draft license agreements, or the legal authority underlying that reasoning." Barnes & Noble Inc. v. LSI Corporation, et. al., 3-11-cv-02709 (CAND December 23, 2012, Order) (Beeler, M.J.). Following its grant of summary judgment of noninfringement, the court granted plaintiffs' motion to enjoin defendant from pursuing infringement claims against plaintiffs' customers, licensees, distributors, users, and suppliers in another forum. "[I]n terms of the first element of injunctive relief of enjoining the lawsuit, enjoining [declaratory judgment defendant] from pursuing lawsuits, either those pending or new lawsuits relating to the [patents-in-suit] and relating to [accused products], since my ruling [granting summary judgment of noninfringement] is currently the ruling, [Kessler v. Eldred, 206 U.S. 285 (1907)] indicates that there is a very strong overwhelming likelihood of success on the merits. . . . In terms of the element of irreparable harm, the Court also finds that element has been met. There are difficulties and uncertainties in quantifying the harm of customers who are being sued for their use of a product, which the entity which sold it to them has been found not to be infringing on the suing parties' patent. And the impact on the good will of those customer lawsuits . . . is uncertain and difficult to quantify. The Kessler case, the Court notes, found that there was in fact a difficulty in quantifying the impact on good will. And the Kessler court also said it would be difficult at law to prove the adequacy of money damages. The Court adopts that rationale here." SAP AG, et. al. v. Datatern, Inc., 1-11-cv-02648 (NYSD December 19, 2012, Order) (Forrest, J.). Advanced Messaging Technologies Inc. v. EasyLink Services International Corporation, 2-11-cv-04239 (CACD December 19, 2012, Order) (Pregerson, J.). The court denied defendant's motion for summary judgment that plaintiff was estopped from asserting noninfringement under the patent marking estoppel doctrine. "[T]he Court is disinclined to estop [plaintiff] from claiming noninfringement based on a doctrine that enjoys questionable endorsement, if any, in the Federal Circuit and only sporadic application in the district courts. . . . Of equal concern is the apparent lack of any specific test or clear standard by which courts determine whether the doctrine applies beyond the general proviso that estoppel be imposed only when the defendant’s conduct is such that it would be 'inequitable' to allow it to assert noninfringement. . . . [E]ven if the doctrine remains viable, there is a triable issue of fact as to whether it applies under the circumstances presented here. . . . Conduct such as deliberate mismarking, attempts to benefit from both patent protection and noninfringement in an inconsistent manner, or conduct that creates a risk of consumer confusion or deception would potentially justify estoppel. The Court finds that the current record does not support such a conclusion in this case." Ce Soir Lingerie Co. Inc. v. Imagine Enterprises LLC, 2-11-cv-07291 (CACD December 18, 2012, Order) (Gee, J.). The court denied plaintiff's motion for a permanent injunction following a jury trial because the public interest did not favor an injunction. "Though [defendants'] phones do contain infringing features, they contain a far greater number of non-infringing features to which consumers would no longer have access if this Court were to issue an injunction. The public interest does not support removing phones from the market when the infringing components constitute such limited parts of complex, multi-featured products." Apple Inc. v. Samsung Electronics Co. Ltd., et. al., 5-11-cv-01846 (CAND December 17, 2012, Order) (Koh, J.). The court denied in part defendant's motion to exclude testimony from plaintiff's damages expert and rejected defendant's argument that she was not qualified due to her lack of real-world experience. "[Plaintiff] was not required to put forth the 'best qualified' witness but only an individual who could meet the minimum standards for expert testimony set out by the Third Circuit. Whether [plaintiff's expert] is the best qualified and most reasonable expert witness vis-à-vis any expert witness put on by [defendant] is a matter for the jury to resolve. . . . In light of the liberal standard for the qualifications of experts enunciated by the Court of Appeals for the Third Circuit, and the Federal Circuit’s approval of the methods used by damages experts to quantify the hypothetical negotiation, it appears that an appropriately credentialed individual on the issue of intellectual property damages may testify at trial as to application of the Georgia-Pacific factors, including the artificial hypothetical negotiation, despite a lack of experience in actual negotiations." Carnegie Mellon University v. Marvell Technology Group, Ltd., et. al., 2-09-cv-00290 (PAWD December 15, 2012, Order) (Fischer, J.). The magistrate judge recommended granting defendants' motion for summary judgment that execution of the accused firmware at defendant's manufacturing facilities outside of the U.S. did not infringe plaintiff's digital camera patent. "While [plaintiff] vigorously disputes whether infringement is limited to ‘use,’ and vehemently argues that [defendant] is liable for infringement for importing cameras into the United States that allegedly contain [plaintiff's] patented invention, it does not offer evidence to contest the limited issue on which [defendant] is moving for summary judgment - i.e., that the execution of the [accused] firmware at its manufacturing facilities outside of the United States cannot constitute infringement. The law on this issue supports [defendant's] position." Image Processing Technologies, LLC v. Canon Inc. et al, 2-10-cv-03867 (NYED December 13, 2012, Order) (Boyle, M.J.). Brandywine Communications Technologies, LLC v. Casio Computer Co. Ltd., et. al., 6-12-cv-00274 (FLMD December 5, 2012, Order) (Honeywell, J.). The court denied defendant's motion to sever and transfer venue of plaintiff's claims. "[T]here are several 'actual links' between the facts underlying each claim of infringement against each Defendant, which links involve accused products comprising commonly sourced parts. . . . [Plaintiff] has shown – and [defendant] has not refuted – that all of the accused products operate the same way relative to the patents (by complying with the [same] standard) and that all of the accused products incorporate technology sourced from the same company. This Court believes that these are precisely the sort of 'actual links' that the Federal Circuit had in mind when it discussed the propriety of joinder in patent cases." Negotiated Data Solutions, Inc. v. Apple Inc., et. al., 2-11-cv-00390 (TXED December 11, 2012, Order) (Gilstrap, J.). The court denied defendant's motion to dismiss for lack of standing where the patent assignment contained a limitation on attorneys' fee agreements. "[T]he [assignment from the original patent owner to plaintiff's assignor] prohibits [plaintiff's assignor] from retaining outside counsel for infringement suits where such counsel would be entitled to collect contingent fees of more than 20% of damages or other revenues. This provision simply protects [the original owner's] compensation for the assignment of the patent by ensuring that the revenue stream derived from the patent is not depleted by extravagant legal fees, which are not uncommon." Suffolk Technologies, LLC v. AOL, Inc., et. al., 1-12-cv-00625 (VAED December 7, 2012, Order) (Ellis, J.). The court granted defendants' motion to dismiss plaintiff's declaratory relief action under the first-to-file rule where defendant's earlier filed suit was refiled after being dismissed for joining 45 unrelated defendants in violation of the America Invents Act. "[Plaintiff] argues that [defendant's original] lawsuit was 'legally infirm' from the beginning, and that therefore this is the 'first-filed' lawsuit. . . . I do not think the original California lawsuit was 'legally infirm'. . . . The similarly-situated first named defendant in [defendant's original] lawsuit was allowed to proceed; the other defendants were told (essentially) to refile their lawsuits separately and any such lawsuits would be treated as related cases. In these circumstances, I do not think there is any legal reason not to treat [defendant's] extant suit against [defendant] as the 'first-filed' lawsuit. . . ."
Sony Electronics Inc. v. Digitech Image Technologies LLC, et. al., 1-12-cv-00980 (DED December 7, 2012, Order) (Andrews, J.). e2Interactive, Inc., et. al. v. Blackhawk Network, Inc., 3-09-cv-00629 (WIWD December 6, 2012, Order) (Crocker, M.J.). The Commission issued a general exclusion order directed to infringing lighting control devices despite the ALJ's finding, and the Commission investigating attorney's agreement, that complainant failed to establish that an exclusion order was necessary to prevent the circumvention of the recommended limited exclusion order. "[T]he facts here establish business conditions that suggest circumvention of an LEO may be likely to occur. [Complainant] has submitted evidence showing significant and increasing demand for the infringing products, widespread U.S. marketing and distribution networks with multiple intermediaries, a large number of non-respondent foreign manufacturers/distributors, and frequent name changes for foreign manufacturers/distributers. . . . [Complainant] has also presented evidence that [a respondent in a prior investigation] circumvented a Commission consent order by selling dimmer switches that infringe the [asserted] patent under its own and under a different name. Contrary to the IA's argument, this record evidence is relevant to the Commission's determination of whether a likelihood of circumvention of an LEO exists. . . . [T]he ALJ misstated section 337(d)(2)(A) which only requires 'circumvention,' not a 'pattern of circumvention,' and which may be satisfied. . . by a single company engaged in infringing activities that indicate circumvention. . . ."
Lighting Control Devices Including Dimmer Switches and Parts Thereof (IV), 337-TA-776 (ITC November 7, 2012, Order) (Trade Commission, J.). The court granted plaintiffs' motion for summary judgment that defendant's conical crusher patent was invalid as obvious. "[T]he only question is whether separating the seal and piston into two unattached parts would have been obvious to a person having ordinary skill in the art. To ask that question is almost to answer it: it is generally obvious to separate a single component into two components that together perform the same function as the single component. . . . JCI’s decision to put a 'seal portion' between the hydraulic fluid and the 'piston,' as in claims 9 and 10, did not result in a unobvious modification of the prior art." Metso Minerals Industries Inc., et. al. v. Astec Industries Inc., et. al., 2-10-cv-00951 (WIED December 4, 2012, Order) (Adelman, J.). The court granted defendant's motion to stay pending ex parte reexamination of six patents-in-suit and rejected plaintiff's argument that it would be at a tactical disadvantage because of "Defendant’s initial delay in seeking reexamination, followed by its rush to file reexamination requests before the new and quicker America Invents Act reexamination procedures became effective. . . . Defendant cannot be faulted for failing to seek reexamination before it was served with Plaintiff’s summons and complaint. . . . [E]ven if Defendant was aware of Plaintiff’s active infringement litigation against other parties, such notice created no duty for Defendant, a third party, to seek reexamination. Once sued, Defendant acted promptly by filing six reexamination requests within two months. . . . [T]hat Defendant submitted its requests just days before new reexamination procedures were to be instituted did not constitute an undue prejudice towards Plaintiff." Robert Bosch Healthcare Systems, Inc. v. Cardiocom, LLC, 5-12-cv-03864 (CAND December 3, 2012, Order) (Davila, J.). The court denied plaintiff's motion to strike defendant's pleadings as a sanction for production of an altered hard drive from one of defendant's software contractors, but the court granted plaintiff's motion for evidentiary sanctions. "The appropriate remedy in this case is more challenging to determine than in other cases because the spoliator in this case . . . is a non-party, independent contractor for [defendant], and not within the Court’s jurisdiction. Nonetheless, it is [defendant] who benefits from the lack of any adverse creation dates . . . or other negative metadata on any of the CAD files that [plaintiff's] expert might have found, had files not been deleted. . . . There is no jury instruction, however, that can effectively protect the victim of a willful spoliation from the prejudice created by willful deletion of files with the manual running of a Ccleaner program. . . . The Court will not strike [defendant's] affirmative defenses and counterclaims – which is akin to the extreme sanction of a default or dismissal in this patent dispute – for the conduct of a non-party witness only partially under the control of [defendant]. . . . [The contractor] will not be allowed to testify at trial and evidence that originated with him will be excluded. . . . [Defendant] will not be allowed to rely on [its contractor's] deposition testimony for summary judgment purposes or at trial, and [it] will not be allowed to rely on any documents . . . sent from or to [the contractor] that [defendant] has produced." Pacific Coast Marine Windshields Limited v. Malibu Boats, LLC, et. al., 6-12-cv-00033 (FLMD November 30, 2012, Order) (Baker, M.J.). The court denied defendants' emergency motion to strike plaintiff's attempt to include sales of accused chips outside of the U.S. in its damages calculations. "Admittedly, there is no case exactly on point. On the other hand, [plaintiff] has put forth sufficient facts to support its theory, albeit novel. [Plaintiff] intends to prove that the alleged infringing method is used during [defendant's] sales cycle, which is performed here in the United States, where both its engineers and customers are located. [Plaintiff] seeks damages for this sales cycle infringement by claiming a reasonable royalty rate on all of the chips that are produced during this sales cycle and purchased based on the result of said cycle. In this Court’s view, one of the simplest ways to determine the value of an infringing use of a patented method during research is to ascertain how many sales were made based on that infringing use." Carnegie Mellon University v. Marvell Technology Group, Ltd., et. al., 2-09-cv-00290 (PAWD November 29, 2012, Order) (Fischer, J.). The court granted defendants' motion to stay pending inter partes reexamination and rejected plaintiff's argument that the influx of reexamination requests due to the America Invents Act caused plaintiff undue prejudice. "[Plaintiff] argues that the recent influx of requests for reexamination at the PTO will cause extraordinary delay. The [AIA] amended the inter partes reexamination process for all requests filed after September 15, 2012. Because of this deadline, the PTO received an unusually large volume of reexamination requests in September 2012. At oral argument, [plaintiff] argued that this high volume of requests will cause the PTO’s reexaminations of the [patents-in-suit] to extend to 7 to 10 years. However, the actual effect of the Act on the PTO’s reexamination process remains to be seen. . . . Given the uncertainty of the PTO’s future workload, [plaintiff] has not provided persuasive evidence that the reexaminations of the [patents] will be pending for nearly a decade. On the other hand, [defendant] promptly requested the reexaminations after the dispute between the parties emerged, and [it] has not engaged in improper litigation tactics that might otherwise warrant declining a request for a stay." Polaris Industries, Inc. v. BRP US Inc., et. al., 0-12-cv-01405 (MND October 29, 2012, Order) (Montgomery, J.). The court granted in part plaintiff's motion to strike defendant's prior art statement and barred defendant from relying on any combination of prior art to assert its obviousness defense without a detailed explanation of how the combination invalidates the claims. "If [defendant] intends to rely upon all 1406 possible combinations, then it must individually list each combination and explain in detail how each combination renders one or more of [plaintiff's] claims obvious. The potential length of a prior art statement does not excuse non-compliance with this Court’s Order. . . . While [defendant] identifies legitimate potential reasons to combine, it does not actually include these reasons in any explanation of a specific combination. Instead, [it] simply listed broad reasons to combine that could be used in a §103 defense and then claimed that all of these reasons apply to all 1406 or more potential combinations. Like [defendant's] method of listing potential combinations, this tactic does not comply with the spirit or intent of this Court’s Order." AGA Medical Corp. v. W.L. Gore & Associates, Inc., 0-10-cv-03734 (MND October 26, 2012, Order) (Mayeron, M.J.). The court denied defendants' motion in limine to exclude plaintiff's damages expert's determination of a 10-15% royalty rate. "[Defendant] argues [plaintiff's expert] improperly arrived at a 10-15% royalty rate by dividing the profit margins of [plaintiff] and [defendant] in half and using the resulting figures as the upper and lower limits for the rate. [Defendant] contends this is a 'supercharged' 50% version of the '25% rule of thumb' rule rejected by the Federal Circuit. . . . Because [plaintiff's expert] used the [Georgia-Pacific Corp. v. U.S. Plywood Corp., 318 F. Supp. 1116 (S.D.N.Y. 1970)] factors to determine his reasonable royalty rate range of 10-15%, rather than a version of the unreliable 25% rule, the Court will not exclude [his] royalty rate analysis." Halo Electronics, Inc. v. Bel Fuse Inc., et. al., 2-07-cv-00331 (NVD October 25, 2012, Order) (Pro, J.). Realtime Data, LLC d/b/a IXO v. MetroPCS Texas, LLC, et. al., 6-10-cv-00493 (TXED October 23, 2012, Order) (Love, M.J.). The court denied defendants' motion to exclude plaintiff's three RAND experts who used an ex ante, multilateral negotiation analysis instead of a bilateral analysis. "[T]he court can find no instance where a prior court has been called upon to make a determination of a reasonable royalty rate for a block of standard essential patents held out by the patent holder for licensing on RAND terms. . . . [Plaintiff's] proposed framework seeks to address this concern by contemplating a negotiation (for determining a RAND rate) at a time just prior to adoption of the standard, thereby eliminating excess value added to the patents through the adoption of the standard. Indeed, this ex ante interpretation of a RAND royalty rate has been endorsed by numerous publications and the Federal Trade Commission. . . . [A]s [plaintiff's] counsel admitted at oral argument, an ex ante negotiation may not fully, or at all, address [defendants'] ex post promise that it license its standard essential patents on RAND terms. Such discrepancies between the methodology and the circumstances of the present case can be addressed at trial through cross examination." Microsoft Corporation v. Motorola Inc., et. al., 2-10-cv-01823 (WAWD October 22, 2012, Order) (Robart, J.). The magistrate judge recommended granting defendants' motion to transfer venue of plaintiff's infringement action from the Middle District of Florida to the District of Oregon and found that plaintiff's choice of forum was not entitled to considerable deference. "[N]either the Plaintiff company nor the facts underlying its patent infringement claims appear to have any meaningful connection to this District. While Plaintiff is a Florida corporation with its principal place of business now physically located in the Middle District of Florida, the facts and circumstances underlying this patent suit appear to have no other significant connection or relationship with this District apart from the fact that the Defendants sell their products in the State. . . . [Plaintiff] was incorporated in Tampa, Florida. . . only shortly before suit was filed. . . . . The inventor. . . continues to reside in England. . . . [A]part from the fact that [defendants] do business in the State of Florida, there appears no other connection between the allegations of patent infringement and this District." Evans Design Dynamics, LLC v. Nike, Inc., et. al., 8-12-cv-00493 (FLMD October 22, 2012, Order) (McCoun, M.J.). The court converted defendant's motion to dismiss to a motion for summary judgment and rejected defendant's argument that it could not be liable because another entity submitted the ANDA at issue. "[Defendant] contends that only one entity can 'submit' the ANDA to the FDA and thus incur [35 U.S.C. § 271(e)(2)] liability and that said entity must be the named applicant. The statute’s text does not define the term, 'submit,' and neither the Federal Circuit nor the Supreme Court has construed the term in this context. . . . [Defendant] has been more than actively involved in the submission; it has taken every relevant action except the final formalities. In these circumstances, to find [another defendant] but not [the moving defendant] has 'submit[ted]' the ANDA pursuant to section 271(e)(2) would be to elevate form over substance." Purdue Pharma L.P., et. al. v. Varam, Inc., et. al., 1-10-cv-06038 (NYSD October 19, 2012, Order) (Stein, J.). The court granted defendants' motion to stay pending a second reexamination and rejected plaintiff's claim of undue prejudice because the parties were competitors. "Plaintiff waited over one and a half years since the Patent emerged from reexamination. . . before commencing this infringement action. Plaintiff also chose not to include Defendants in [another suit involving the same patent], which was filed over a year before this suit. Second, Plaintiff decided not to seek a preliminary injunction against Defendants in this action, which tends to suggest that Plaintiff would not be unduly prejudiced by staying this litigation. Third, Plaintiff admits that it offered Defendants a license to the Patent before filing this suit." Phil-Insul Corp. v. Airlite Plastics, Inc., et. al., 8-12-cv-00151 (NED October 18, 2012, Order) (Gossett, M.J.). The ALJ denied complainants' motion to strike respondents' notice of prior art containing 1,818 references where complainants were asserting more than 100 claims over 4 patents. 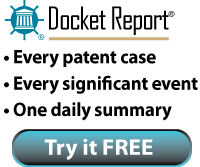 "Nonetheless, the [ALJ] is concerned about the number of prior art references noticed, just as he was concerned about the number of asserted patent claims. . . . [Respondents] should be mindful of needlessly consuming the time, energy, and resources of complainants, as well as that of the administrative law judge. Thus, respondents are ordered to file biweekly declarations detailing their efforts to reduce the number of references listed in their notice of prior art." Audiovisual Components, 337-TA-837 (ITC October 4, 2012, Order) (Shaw, ALJ). The court granted defendants' motion for summary judgment that plaintiffs' DNA sequencing patent was invalid as obvious based on a prior art patent application filed two months before the application for the patent-in-suit, and the court rejected the inventor's claim that he was diligent during that two-month delay. "[Defendant] argues persuasively that the implications of [the inventor's] busy professional life are quite different: by prioritizing other work over the. . . patent application, particularly his contract work for [a third party], [the inventor] did not act diligently, but instead voluntarily set aside his own work in favor of someone else’s, outside of the bounds of his normal professional obligations. . . . [The inventor's] own invention was at the bottom of his priority list, and. . . that cannot support a finding of diligence." Illumina Inc., et. al. v. Complete Genomics Inc., 3-10-cv-05542 (CAND October 16, 2012, Order) (Laporte, M.J.). The court denied defendant's motion for summary judgment that it did not willfully infringe plaintiff's board game patent. "When, as in this case, a party defends against a charge of willful infringement by pointing to a 'reasonable' defense that turns on a disputed question of fact or a mixed question of law and fact, the trial court may 'allow the jury to determine the underlying facts relevant to the defense in the first instance.'. . . [Other] courts have concluded that the best course of action is to reserve [In re Seagate Tech., 497 F.3d 1360 (Fed. Cir. 2007)]'s first, objective prong until the parties make a full presentation of the evidence, subject to cross-examination, on the record and the jury has been given an opportunity to resolve any necessary fact finding." Innovention Toys, LLC v. MGA Entertainment, Inc., et. al., 2-07-cv-06510 (LAED October 15, 2012, Order) (Morgan, J.). The court granted defendant's motion to disqualify plaintiff's newly substituted counsel and rejected plaintiff's argument that its counsel represented a company other than defendant. "[Plaintiff's counsel] has provided records which indicate that all correspondence was directed to [defendant's parent]. It is undisputed that [the parent] is merely a holdings company and that its subsidiaries are the operating companies. . . . It is evident that the work [counsel] performed at the behest of [the parent] was, in fact, related to [defendant's] technology and, specifically, to the technology at issue in this litigation. . . . Perhaps even more significant is that the inventors of the technology at issue in this litigation were also technically employed by [the parent] even though it is undisputed that the technology belongs to [defendant]. . . . Finally, the Court finds it interesting that many of [counsel's] bills were paid, not by [the parent], but by [another subsidiary]. The fact that the invoices were paid by yet another, separate entity, and the fact that [counsel] did not object to receiving payment in this manner, further supports the conclusion that [the parent] was not [counsel's] true client." Synchronoss Technologies, Inc. v. Asurion Mobile Applications, Inc., 3-11-cv-05811 (NJD October 11, 2012, Order) (Bongiovanni, M.J.). The court denied defendant's motion to disqualify three attorneys representing plaintiff even though those three attorneys previously represented defendant in patent matters while at another law firm because there was not a reasonable probability that the attorneys had access to confidential information that could be used to defendant's disadvantage. "[T]his confidential information factor is a closer call. . . . [Defendant] cannot carry its burden by simply stating that [the attorneys] have knowledge of [its] 'practices and procedures.'. . . An allegation that [the attorneys] were made aware of [defendant's] confidential litigation strategies is insufficient to sustain the confidential information disqualification burden. Every attorney who represents a corporate client would be made privy to 'litigation strategy.' If the Court were to disqualify the [plaintiff's counsel] based on the facts alleged here, disqualification could almost always be supported under the confidential information prong." E-Contact Technologies, LLC v. Apple Inc., et. al., 1-11-cv-00426 (TXED September 26, 2012, Order) (Giblin, M.J.). The court denied plaintiff's emergency motion to disqualify an expert who had met with plaintiff regarding this same case, discussed hypothetical arguments regarding claim interpretation with plaintiff's counsel, and then was hired by defendant a week later. "[A]fter [plaintiff's counsel]. . . explained [plaintiff's] position about how the claims should be interpreted . . . [the expert] proposed an argument [defendant] might make in response. [The expert] recalls that [counsel] did not want to discuss the subject any further and did not respond with anything of substance. [Plaintiff's counsel] recalls that she responded in a substantive fashion as to how [plaintiff] would address this hypothetical. . . . [T]he hypothetical posed by [the expert] and [counsel's] unsolicited response thereto do not constitute confidential information sufficient to disqualify [the expert] from consulting for [defendant]. . . . [T]he nature of the relationship and of the information allegedly disclosed instantly is much too abbreviated to warrant such a drastic sanction." Butamax (TM) Advanced Biofuels LLC v. Gevo Inc., 1-11-cv-00054 (DED October 10, 2012, Order) (Robinson, J.). The court granted in part defendant's motion to strike plaintiff's amended infringement contentions because plaintiff's claim chart did not comply with the patent local rule for specificity. "Plaintiff repeatedly attempts to hedge its bets. For each of these limitations, Plaintiff first articulates a theory of infringement (e.g., the infringing portion of the accused product involves [[ ]]), then tries to cover its bases by articulating a second theory that is wholly contingent on the position that might be taken by Defendant (e.g.,. if Defendant argues that there are [[ ]], then the infringing portion of the accused product involves [[ ]]). . . . Plaintiff’s 'contingent' formulation obfuscates the exact substance of Plaintiff's allegations and does not 'crystallize [Plaintiff's] theories of the case,' as Rule 3-1 commands." Infineon Technologies AG v. Volterra Semiconductor Corporation, 3-11-cv-06239 (CAND October 9, 2012, Order) (Ryu, M.J.). The court granted plaintiff's motion to compel defense counsel's opinions regarding the patent-in-suit from seven and eight years ago. "[Plaintiff] propounded discovery requests encompassing [defense counsel's] opinions. . . . [Defendant] raised the attorney-client privilege and work-product protection in response to [plaintiff's] requests for production that would have encompassed [its counsel's] opinions. However, [defendant] did so without specificity. . . . By not including [its counsel's] opinions in its privilege log, [defendant] has waived the privilege." Nordock Inc. v. Systems Inc., 2-11-cv-00118 (WIED October 5, 2012, Order) (Randa, J.). The court denied a group of retailer-defendants' motion to stay plaintiff's infringement action against them pending the outcome of plaintiff's claims against a manufacturer who agreed to indemnify those defendants. "[The manufacturer-defendant's] agreement to indemnify the Retailers does not obviate the need for a final judgment against the Retailers, if the jury returns a verdict in [plaintiff's] favor regarding patent validity and damages. . . . [Plaintiff] has no standing to enforce the indemnity agreement between [the manufacturer-defendant] and the Retailers and is not required to rely on that agreement rather than its right to proceed directly against the Retailers. Consequently, the Court rejects the Retailers’ argument that their participation at the trial is 'peripheral.'" Innovention Toys, LLC v. MGA Entertainment, Inc., et. al., 2-07-cv-06510 (LAED October 4, 2012, Order) (Morgan, J.). The court granted plaintiff's motion for jurisdictional discovery while a group of individual defendants' motions to dismiss for lack of personal jurisdiction and improper venue were pending. "Plaintiff noted. . . that the individual Defendants personally recorded a Kickstarter advertising message in which they disclosed their names and position as students at the University of Washington. . . . However, their personal efforts for the online Kickstarter campaign seem most analogous to advertising in a national trade publication, which. . . does not give rise to state-specific jurisdiction where appellants could not show that an appellee-defendant had 'targeted' the state in question. . . . [W]hile it has not yet met its prima facie burden, Plaintiff has demonstrated that it may supplement its jurisdictional allegations as to the individual Defendants through discovery." Robinson v. Bartlow, et. al., 3-12-cv-00024 (VAWD October 3, 2012, Order) (Moon, J.). The court denied plaintiff's motion for summary judgment of induced and contributory infringement because defendant had obtained an opinion letter indicating that one of plaintiff's automated nucleic acid-based targeting patents was invalid as obvious. "[Defendant] argues that this opinion letter and subsequent legal opinions obtained are sufficient to create a triable issue of fact on whether [it] had the requisite specific intent to encourage another’s infringement. . . . The parties acknowledge the Federal Circuit has not addressed this issue. . . . Rather than find that the opinion letter is entirely excluded from considerations of infringement or that it is dispositive in favor of [defendant], the Court finds the opinion letter is sufficient to create a triable issue of fact." Gen-Probe Incorporated v. Becton Dickinson and Company, 3-09-cv-02319 (CASD September 28, 2012, Order) (Benitez, J.). “Same Transaction” Required for Joinder Under 35 U.S.C. § 299 Does Not Encompass Separate Transactions Within a “Commerce Stream"
The court sua sponte severed two distributor-defendants from plaintiffs' infringement action because they were improperly joined with manufacturer-defendants under 35 U.S.C. § 299. "Plaintiffs . . . fail to allege that each of these Defendants was involved in the same transaction or series of transactions. Plaintiffs allege that [one defendant] 'developed and commercialized the [accused] products' . . . which it licensed to [a manufacturer-defendant] for manufacture and sale. [The manufacturer-defendant] in turn authorized [the distributor-defendants] as its distributors for the [accused] products. Even assuming that each Defendant was infringing on the same products, the only related transactions between these entities are those transactions within the commerce stream. But these transactions within the commerce stream do not constitute the same transaction or series of transactions. . . . [The distributor-defendants'] liability arises from its sale (or offer for sale) of the [accused] products to an end-user. This is entirely different from [the manufacturer-defendant's] liability, which arises from its sale (or offer for sale) of its [accused] product to [a distributor-defendant]." Mednovus, Inc. v. QinetiQ Limited, et. al., 2-12-cv-03487 (CACD October 1, 2012, Order) (Wright, J.). The court granted defendants' motion to dismiss plaintiff's infringement claim for failure to state a claim because the asserted patent had been the subject of a terminal disclaimer but plaintiff did not own the prior patent. "The parties agree with binding Federal Circuit precedent that holds that if the ownership of a disclaimed patent is separated from the prior patent, the disclaimed patent is not enforceable. . . . Plaintiff’s argument that both the [patent-in-suit], owned by Plaintiff . . . and the [prior patent], owned by [a different entity], are owned by Acacia by virtue of its 100% ownership of [plaintiff] and [the other entity] goes against a 'basic tenet of American corporate law . . . that the corporation and its shareholders are distinct entities. . . . A corporate parent which owns the shares of a subsidiary does not, for that reason alone, own or have legal title to the assets of the subsidiary.'" Email Link Corp. v. Treasure Island, LLC et al, 2-11-cv-01433 (NVD September 25, 2012, Order) (Reed, J.). The court granted plaintiff's motion for summary judgment that defendant's patents related to the electronic sale of fixed-income assets were invalid for failing to claim patent-eligible subject matter. "The patents are directed at 'systems and methods that allow for the electronic sale of a component of a fixed income asset' . . . Defendant emphasizes that the method recites neither 'a mathematical formula' nor a 'fundamental economic practice,' and stresses the method's use of computer components. But a review of the substance of the claim demonstrates that, at its core, the claim is directed toward computer components that are used simply to facilitate the computation of various equations. As this Court previously stated, the use of the machine must be more than 'incidental use . . . to perform [a] mental process.'" Federal Home Loan Mortgage Corporation v. Graff/Ross Holdings LLP, 1-10-cv-01948 (DCD September 27, 2012, Order) (Leon, J. ).